The festival presents mostly folkloric dances, songs, traditional food and some participation of renowned singers and actors. It is also, of course, an opportunity to present the excellent Lefkara embroideries and silverware, traditional crafts for which Lefkara has been known for many years. For a week the village of Lefkara will be host to personalities,tourists and Cypriot visitors, offering them traditional hospitality. The picturesque village of Lefkara was popular as a summer resort during the Venetian period. The ladies of the village spent their time working on embroidery, the art having been handed down through generations. It is said that this embroidery was first introduced by the Assyrians, developed by the Byzantines and refined by the Venetians. The fame of this embroidery, called lefkaritiko, spread to many countries� according to legend, Leonardo de Vinci visited Cyprus and took back with him Lefkara lacework which he presented to Milan Cathedral. 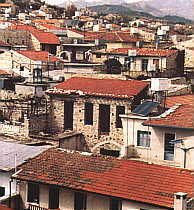 Lefkara is actually a twin village, Pano Lefkara (upper) and Kato Lefkara (Lower). The upper part is bigger and richer, while the smaller, lower village retains its traditional image, with narrow winding streets, small clustered houses and just two coffee shops. The upper village has been developed into a touristic attraction. There are many shops selling tourist souvenirs as well as the famous embroideries and silver jewellery, trays, traditional plates. Here too you will find spoons and forks, used to offer home-made confectioneries, which are locally produced, each piece being unique in design and shape. Pano Lefkara also has a museum of local art and craft, telling the history of the embroidery, lace and silverwork. At the beginning of the century, the men of Lefkara would travel to sell the embroidered tablecloths created by their wives, many going abroad to sell and establish shops.